Since three weeks already, I published here all rumours about the stages and the track of the Tour de France 2008, but since today it's finally official ... this morning A.S.O. organised its official presentation of the Tour de France 2008. And I'm happy to see that - apart from some minor differences - my final guesses were really very close to the official track! The three stages of the Grand Départ in Brittany were almost completely announced already: the only thing which was missing was the finish city for the thrid stage, but all rumours pointed to Nantes and that turned out to be correct! Since there's no prologue all Brittany is part of the party right from the first stage, the one going from Brest to Plumelec, followed by the stages from Auray to Saint-Brieuc and from Saint-Malo to Nantes. The four départements which together form Brittany (Finistère, Côtes d'Armor, Morbihan and Ille-et-Vilaine) will be visited during those three first stages and we can probably expect to see a lot of people alongside the stages' tracks ... that's because Brittany is really a cycling lovers area and the région will therefore probably do everything to make this Grand Départ a Grand Succès! This will be the sixth time the Tour starts in Brittany, but for the last time we have to go back 13 years in: that was in 1995 with a prologue in Saint-Brieuc and the first stage's start in Dinan (the previous editions were Brest in 1952, Rennes in 1964, again Brest in 1974 and Plumelec (prologue) and Vannes (first stage) in 1985). It's therefore easy to understand that Brittany was really eager to get a new Tour start! The first stage of the 95th Tour de France will start in Brest in the Finistère (29) and finish in Plumelec in the Morbihan (56). For the first time since 1967 this will not be a prologue but a real stage 'in line'. Going through the Monts d'Arrée, this first stage - of 195 kilometres. The Monts d'Arrée are part of the massif armoricain and have their highest top at the Roc'h Ruz at about 385 metres. Even though the stage details haven't officially been published, the Le Télégramme newspaper told its readers on October 18 and 19 all details about the first and all information about the first part of the second stage. The first stage should look something like this: after the start in Brest the riders will take the pont Albert-Louppe to go to Loperhet followed by Daoulas, L'Hôpital-Camfrout, Le Faou, Quimerch, Brasparts, Plonévez-du-Faou, Châteauneuf-du-Faou, Spézet and the col de Toull-al-Laëron in the Finistère to continue to Gourin followed by Plouray, Guémené-sur-Scorff, Pluméliau, Remungol, Locminé, Bignan, Saint-Jean-Brévelay, Plaudren and finally Plumelec with the climb of the côte de Cadoudal where the finish is planned around 5PM. Auray is one of the 10 villes inédites of the Tour de France 2008: the Tour never had a stage start or finish there before. Connecting Auray in the Morbihan with Saint-Brieuc in the Côtes d'Armor, this stage will show a hilly track with the Mûr-de-Bretagne (a 1,6 km climb at 7,5%) as a bonus; Mûr-de-Bretagne was also part of the Tour de France 2004 and 2006. According to the aforementioned information of the Le Télégramme newspaper the first part of the second stage - 165 km long - would be as follows: start in Auray going to Landaul, Pluvigner, Camors, Baud, Pont-Augan, Bubry, Melrand, Boderel, Guern, Le Sourn, Pontivy, Neulliac and Saint-Jean in the Côtes-d'Armor. The stage will then continue to Saint-Brieuc where it will finish. After the start in Saint-Malo the stage will follow a hilly track close to the Rance river and going to Dinan and Calorguen, to continue south through Brittany to finally finish in Nantes. This individual time trial is really short: in only 29 kilometres the best time riders will be able to show what they can do! With its start and finish in Cholet - which has also been a Tour city in the Tour de France 1936 and 1998 which was won by the Dutch sprinter Jeroen Blijlevens - the Choletais (the people who live in Cholet) will probably all come to see this individual time trial! This stage is the longuest of the Tour de France 2008 and connects Cholet to Châteauroux in not less than 230 kilometres. This stage will probably see one or more riders escape from the pack and one of them winning the stage; otherwise this stage will definitely finish in a sprint: this is the last chance for the sprinters before the mountains arrive. Aigurande is the second ville étape inédite of this Tour de France and it's also the start city of the first hilly stage which will take the riders over the Col de la Croix-Morand (8 km at 5,1%) before the finish of the stage at the top of Super-Besse (11 km at 4,7%) in the Massif Central. The second hilly stage will start in the third ville étape inédite of this Tour de France, Brioude. Going to Aurillac the riders will have to climb the Col d'Entremont (6,5 km at 4,7%) and the Col du Pas de Peyrol (Le Puy Mary ; 7,8 km at 6,2%). This intermediate stage will allow some riders to get a big breath after the Massif Central stages while others, especially the sprinters, will use this day to try to win one of the stages before really going in the mountains. Connecting Figeac to the 'pink city', Toulouse, this stage will open the access to the Pyrenees. In 222 kilometres the climbers can use this stage not only to climb the mountains but to climb in the general ranking as well, because there will be no less than 3 mountains to climb this Sunday! Once they left Toulouse the first mountain will be the Col des Ares (6 km at 4,9%), then the Col de Peyresourde (13,2 km at 7,1%) and finally the Col d'Aspin (12,1 km at 6,6%) before going down-hill to Bagnères-de-Bigorre. This tenth stage - which will be on the nationaly French holiday - will also serve for the Etape du Tour, the Tour de France stage for amateur riders organised by A.S.O., on Sunday 6 July 2008. The stage will start in Pau (Tour stage city for the 62nd time!!) and go over the Col du Tourmalet (17,7 km at 7,5%) before finishing at the top of Hautacam (14,2 km at 7,2%). Everyone has to go back to Pau for this rest day, but it will definitely be a well deserved rest day (Pau is becoming a 'all Tours rest day'). Foix is also becoming some sort of a 'have-to-do' during the Tour, last year for example it was the start of the Foix > Loudenvielle le Louron stage. This time it will be the finish city of the stage which starts in Lannemezan and will see the riders climbing the Col de la Crouzette (11,6 km à 7,1%). Between Lavelanet and Narbonne the sprinters will probably again be the show makers. In Narbonne, Narbonne Accessoires, technical partner of the Tour de France and a brand of the Tour de France's advertising caravan will probably try to steal the show (if they want to organise a party for the Tour de France partners that'll definitely be a good idea ;-). Yet another stage for sprinters between Narbonne and Nîmes. This stage - with the same number of kilometres as the day before - will be the last one before the Alps and will start in Nîmes and finish in Digne-les-Bains. The sprinters who manage to stay with the pack in the short climbs at the end of this stage might be able to win another stage just before going to the Alps on the Italian side! Still on the Italian side of the Alps this Monday will be the second rest day of the Tour de France 2008. Second Alps stage with its start in Cuneo in Italy and the riders will have to climb the Col de la Lombarde (21,2 km at 7%) and the Col de la Bonette-Restefond (26,7 km at 6,2%) to finally go down-hill to Jausiers. Cuneo and Jausiers are both villes étapes inédites for the Tour de France and the Col de la Bonette will allow the riders to get to the highest point of the Tour at 2802 metres (the Tour's roof top). Once they left Le Bourg d'Oisans (at the foot of the Alpe d'Huez) this hilly stage will take the riders over a distance of 197 kilometres over the Col de Parménie and La Croix de Montvieux before they arrive in Saint-Etienne. This second and last individual time trial is a bit longer than the first one with 53 kilometers solo from Cérilly (ville étape inédite) to Saint-Amand-Montrond. Etampes, the tenth and last ville étape inédite of this Tour de France will be the start of the last stage, usually a quiet and cool stage ... with champagne, and the finish will of course be in Paris at the Champs Elysées. These 21 stages give a grand total of 3,554 kilometres with 10 flat stages, 5 mountain stages (Toulouse > Bagnères-de-Bigorre, Pau > Hautacam, Embrun > Prato Nevoso, Cuneo > Jausiers and Embrun > L'Alpe d'Huez), 4 hilly stages (Aigurande > Super-Besse, Brioude > Aurillac, Lannemezan > Foix and Bourg d'Oisans > Saint-Etienne) and 2 individual time trials (29 km around Cholet and 53 km from Cérilly to Saint-Amand-Montrond). 4 of the mountain and hilly stages will finish on top of a mountain (Super-Besse, Hautacam, Prato Nevoso and L'Alpe d'Huez) and this Tour totals 19 mountains of the second, first or out of category. There will be 2 rest days: the first in Pau on Tuesday 15 July and the second in Cuneo on 21 July. 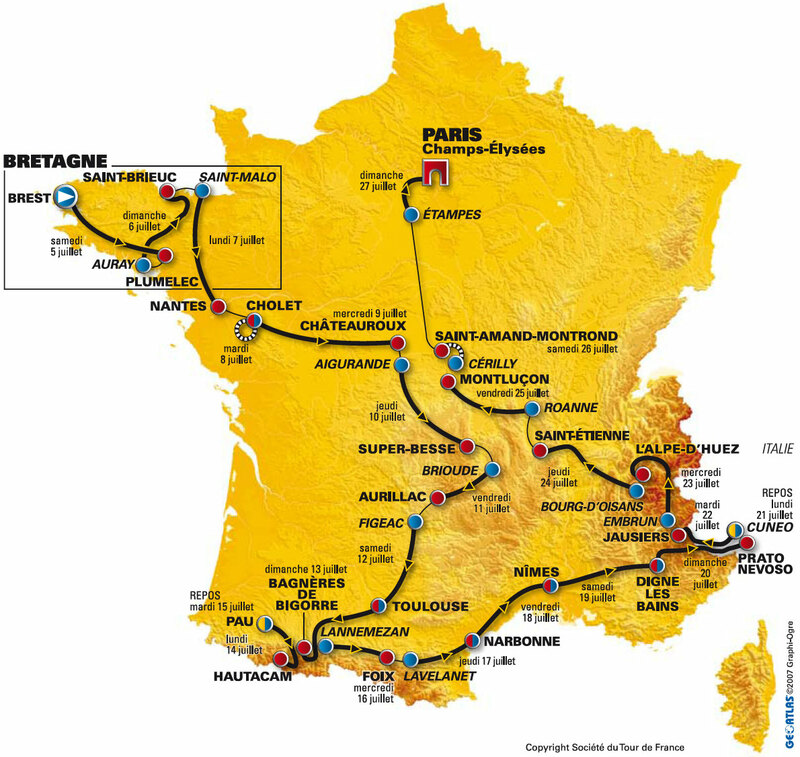 10 stage cities are so called villes étapes inédites: the Tour de France has never had a stage start or finish there before; these cities are Auray, Aigurande, Brioude, Prato Nevoso (in Italy), Cuneo (in Italy), Jausiers, Embrun, Roanne, Cérilly and Etampes. There will be no time bonus for the intermediate sprints nor for the stage winners; there will be 3 intermediate sprints for the first 8 stages and 2 for all following stages. The total prize money is 3.2 million euros for the teams and the riders of which 450,000 euros will be paid to the final general individual ranking in Paris! > Please also have a look at my photos and videos of the official presentation of the Tour de France 2008 on Thursday 25 October 2007 in the Palais des Congrès de Paris.